Preheat the oven to 200C/Gas Mark 6 and adjust a rack to the middle position. Place the chicken on a baking sheet lined with a wire rack, or in a roasting pan with a rack, and drizzle the chicken with olive oil. Generously sprinkle the chicken with salt and pepper. Pack the cavity with the garlic, thyme and lemons. Place the chicken breast-side down on the rack. Roast the chicken for the first hour at 200C/Gas Mark 6, and then turn up the heat to 230C/Gas Mark 8 and roast until the breast temperature registers 70C and the skin is a golden brown, for the last 30 to 45 minutes. Then set the chicken aside to rest and cool. When easy to handle, remove the legs, wings and any dark meat, reserving to eat for your next meal or to snack on immediately. Remove the skin from the breast meat. Using your hands, shred the breast meat and place in a bowl. Season the chicken with salt and pepper. Mix together the yoghurt, mayonnaise, mustard, walnuts, cranberries, celery, onions, lemon zest and juice, tarragon and water chestnuts and adjust the seasoning if necessary. Fold in the shredded chicken. To build the sandwich: Layer the whole wheat wraps with some broccoli sprouts and tomato slices and then top with the chicken salad. 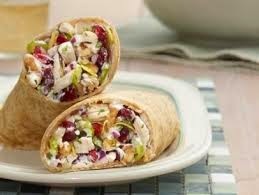 Wrap and enjoy!